We can easily turn your kitchen into your favorite space with our kitchen remodeling services in Dundee & Lakeland, FL. The kitchen in your Lakeland or Dundee, Florida home should be a room that you want to spend time in while cooking, eating, and entertaining. 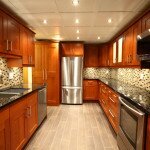 At Jim’s Floor Depot, we can easily turn your kitchen into your favorite space with our kitchen remodeling services. Whether you want to replace the flooring or countertops or rip out the cabinetry and replace it with custom cabinets, our kitchen remodeling services can help you turn the vision you have for your kitchen into a reality. Kitchen Cabinets– At Jim’s Floor Depot, we want you to be 100% pleased with the kitchen cabinets that we install in your home. Because of this, our design consultants will work with you to decide on the most suitable cabinets for your home, and our skilled craftsmen will ensure that they are built and installed in your kitchen with expertise. Kitchen Countertops– We have the best selection of Corian, granite, quartz, and recycled glass countertops in Florida. All of our countertops are premium quality without being overpriced. In fact, many of our customers are pleasantly surprised when we tell them how much new kitchen countertops made out of one of these fine materials will cost. Kitchen Flooring– Laminate, tile, vinyl, and hardwood floors are all flooring options that come with different benefits. We will consult with you to help you decide which flooring option is right for you and which one will complement your countertops best in your newly remodeled kitchen. Contact us today for more information on our Kitchen Remodeling services.